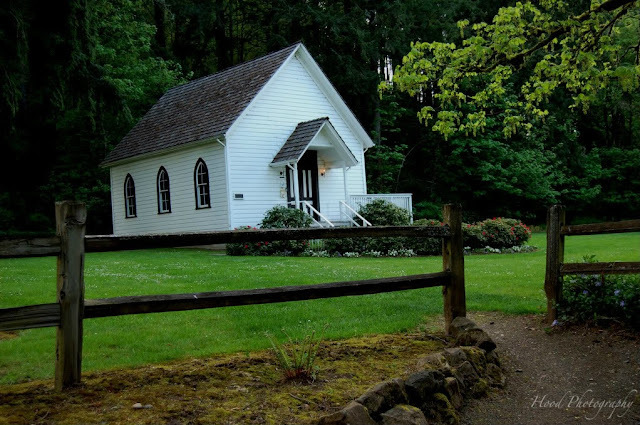 This adorable old church was built in 1895. In the late 1960's, it was saved from demolition and moved to its present site in Carver, OR. It is now part of the Baker Cabin Historical Society, and was accepted to the National Registry of Historic Places in 1976. My friend is looking to get married at this peaceful wooded location in the near future. I can't wait! It reminds me of the schoolhouse/church in "Little House on the Prairie"! So pretty and quaint. Wonderful that it escaped being demolished.. love these little country churches... I wonder if it ever had a bell tower?